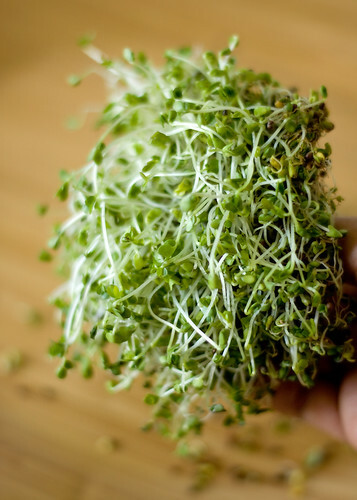 If you are wondering what the heck is pictured above, that’s broccoli sprouts. 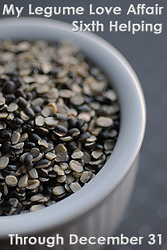 Just like onion, mustard or alfalfa seeds, broccoli seeds are also available in the market for sprouting. They have a mild, but delicate broccoli flavor, and a nice crunch. I am always partial to micro greens. Plus, it’s a lot of fun to watch them grow. I lost count on how many times my attempts to sprout alfalfa were failed. As with other sprouts, I used a jar. They seem to grow just fine, but after three days, they would retain more moisture than they need, and turn mushy. Not to mention, smelly too. I just couldn’t find a way to maintain the right level of moisture. Then, I devised a setup which now works efficiently every single time. This is how I do it. Take a colander (a shallow and fairly broad one) and a bowl on top of which the colander sits well. Fill the bowl with water, sprinkle seeds on the colander, and place on top of the bowl. The seeds will be immersed in water, and let them be for about 10 hours. Then empty the bowl and keep the colander on top. The excess water will slowly drip into the bowl, and keep your counter top clean. Gently rinse the seeds every 12 hours, and continue to keep the colander on the bowl. After 4-6 days, you will see long green sprouts in your colander. Cut the sprouts, and use in recipes. Or refrigerate for later use. My sprouts always seem to find a place in a sandwich or a burger. I love their mild, fresh taste and crunchy texture. 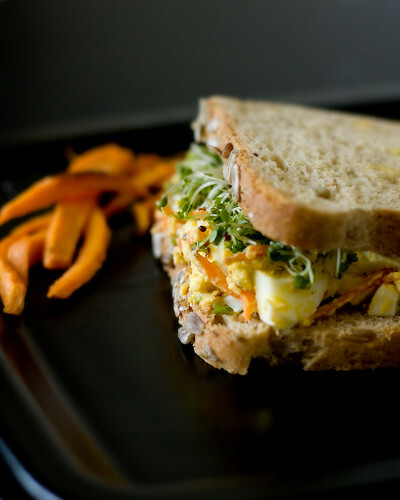 Given below is an egg salad that I whipped one day, when I didn’t have mayonnaise or yogurt on hand. The dressing, made with cooked mashed egg yolks and mustard, is very tasty, that I hardly use dairy products in my egg sandwich anymore. Served on whole grain toasts, they make for a quick lunch, that will keep you full for a long time. Take the eggs in a sauce pan and cover with 1 inch of water. Turn on the heat and let the water come to a boil. When it comes a rolling boil, reduce the heat to low and continue to cook for 10 minutes. Take the eggs off the heat, empty the hot water, rinse once with cold water, drain and give the pan a violent shake. The shells would crack, making them easy to peel. I find peeling eggs easy when they are still warm, or refrigerated for a day. Halve the hard boiled eggs, separating the yolks from the whites. Dice the whites and set aside. In a bowl, take the warm yolks, and mash them to a coarse paste. Add the other ingredients listed under dressing and whisk well to combine. Mix the dressing with diced egg whites and vegetables. Toss to combine. 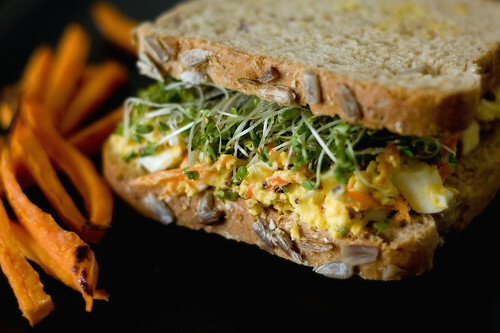 Spread the egg salad on toasted bread, top with broccoli sprouts, followed by another slice of bread. Enjoy with fries, if desired. This is my entry for this edition of JFI, an event started by Indira. Dee of Ammalu’s kitchen, who is guest hosting this month, is calling for recipes with sprouts. Ah, winter, waiting to arrive in just days time. The sign of its onset is already evident here and there. This is a great time to be in the desert Southwest. The days are cool and evenings are cooler, but not cold. We hardly stay indoors these days. The drive around the block, a walk in the park, is all I yearn for during these nights. Its that pleasant here. I see a lot of people still cruising around in their city shorts, taking in this wonderful weather, as much as they can. So, to my friend who bragged about fishing on a July afternoon on a mild 80F degree day, I say ‘Touche’. And, for those who were nice to me during summer, please visit us and enjoy the beautiful desert evenings. To add to the beauty, it rained the whole of this week. The air was crisp, and was, for a change, humid. When I opened the curtains in the morning and saw the pouring rains, I craved for a bowl of steamy hot soup. Not just any soup, but the thick, creamy, hearty kind. With no particular idea on mind, I chopped the vegetables and tossed in the oven. Not wanting to cut any more vegetables, I chose a lentil base for the soup. The soup was everything I craved for and more. All that was left behind were empty bowls, full stomachs and content smiles. Cut all the vegetables into big chunks. Set bell peppers aside. Mix rest of the vegetables with thyme, salt, pepper and olive oil. Spread on a baking sheet covered with foil. Cut the whole head of garlic into two halves, horizontally. Season with salt, pepper and olive oil. Wrap the halves in separate pieces of foil. Keep the prepared garlic head nestled among the vegetables. Bake at 450F for 30 minutes, turning once in between. Add the reserved bell peppers, toss and bake for another 10 minutes. The vegetables should be caramelized around the edges. Let cool slightly. Squeeze the some or all of the roasted garlic over the vegetables, per your liking. Refrigerate the rest in an airtight container for about 10 days. 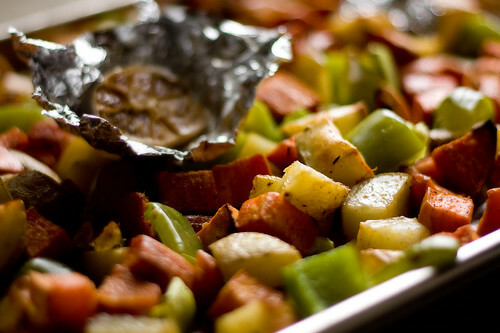 Serve the roasted vegetables as such, or with any other carbohydrate like lentils, rice, quinoa, pasta, etc. Even if there are only two of you, make a whole batch, or even double it. The vegetables refrigerate well and leftovers come very handy. Wash all the lentils together. Pressure cook dal with 4 cups of water, minced ginger and green chillies for 4 or 5 whistles. Let the pressure die down. 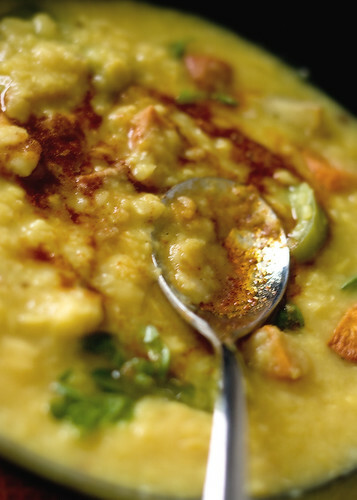 Take the cooked dal from the cooker, add salt and whisk vigorously until it becomes soupy. Add more water if required. Heat ghee over medium heat. Take off the flame and add cumin powder, followed by chilli powder. Whisk immediately taking care not to burn the spices and add to the dal. 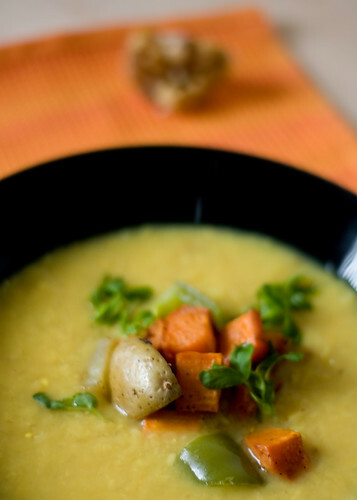 Serve dal as such or mix about 2 cups of roasted vegetables. This is my second entry of My Legume Love Affair, Sixth Helping - Hot & Spicy. This has been an active week in the blogging front. Well, I wanted to post my entries to MLLA before I take a short break. I will not be around for 2 weeks starting next Monday. So if your mails go unanswered, please be patient. I am hoping to schedule few posts while I am gone, if time permits. When I am short on time, but still want a wholesome dinner, this is my absolute favourite. 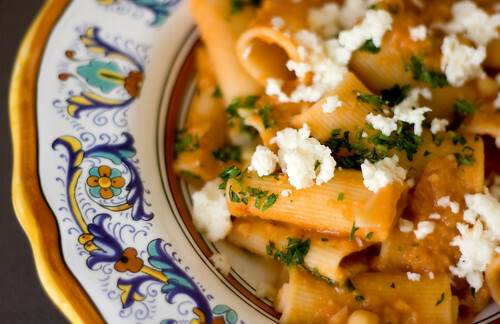 Pasta with ground chickpea sauce is not only creamy, but very filling. This thick and hearty sauce is rich in fiber and protein, and that makes me feel at ease for not including vegetables in a meal, as I normally do. With common pantry ingredients, this dish comes together in a snap. Or if you are like me, you will always have soaked legumes on hand. Heat oil in a deep pot, sauté onion, and garlic until soft. Stir in rosemary, and cook for another minute. Stir in tomatoes, red pepper flakes and salt and cook until tomatoes are softened. Stir in 1 cup of chickpeas (reserve the rest for later), 1 cup if water and heat through. Remove from heat, and blend the mixture until smooth. A hand blender is very handy for this job. Return to heat, keep warm. While you are preparing the sauce on one side, bring a pot of water to boil and cook pasta following package instructions. Pasta should be cooked, but still firm. Drain pasta and reserve 1 cup of cooking water. Mix cooked pasta with the chickpea sauce, along with the reserved whole chickpeas. The pasta should be slightly soupy, as it will absorb more water. Add some of the reserved pasta water, until desired consistency is reached. Serve with a garnish of crumbled cheese and fresh herbs. Omit cheese for a vegan version. This is my entry to My Legume Love Affair, Sixth Helping: Hot & Spicy. 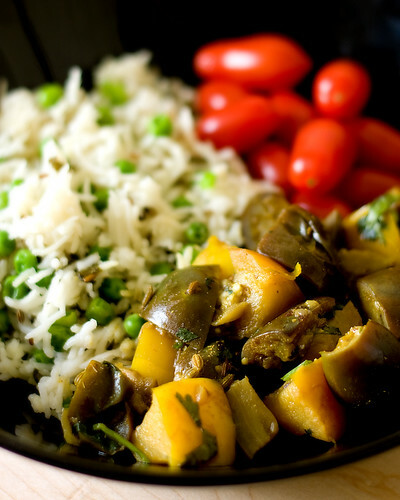 If you have spicy legume dishes to share with us, send 'em to me before the end of this month. As another year is drawing to a close, here I am wrapping up another edition of Vegan Ventures. I am amazed at the response this event gets, for two consecutive years. I challenged the bloggers to come up with a dish with no animal products whatsoever, and my inbox was flooded with amazing entries, from the very next day. One thing I noticed between last year and now is, in addition to increased response, more and more bloggers are geared toward conscious cooking. I was bombarded with wholesome recipes utilizing natural ingredients. Vegan Ventures was an initiative to learn explore veganism. As a cook, who focuses on healthy and natural cooking, I found many healthy dishes can be made without any animal products. I enjoyed the challenge of veganising many of the vegetarian recipes. I understood that there were many bloggers with the same notion as I did. And so I made it into a food event occurring during November, the National Vegan Month. I would like to express my appreciation to all the fellow bloggers who were kind enough to share their favourite vegan recipes with the rest of us. Many bloggers sent in multiple entries. A shout out to Priya of Easy N Tasty Recipes for sending 10 entries. This gallery has all the entries accompanied with their pictures. Its no secret that with chestnuts, it was ‘love at first taste’ for me. They are in season and I can’t seem to get enough of these mildly sweet nuts. Warm roasted chestnuts with spicy Indian chai is the usual deal on winter evenings. But lately, I am on the lookout for recipes to cook with ‘em. Recently, Vegetarian Times published a few chestnut recipes, as though answering my request. 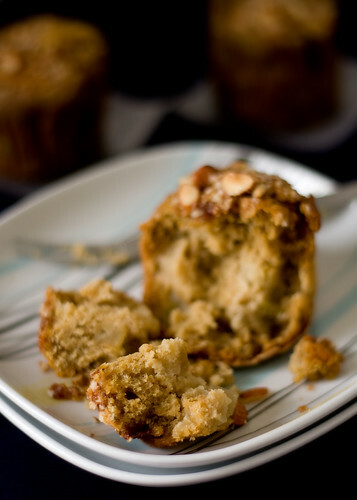 I tried every one of ‘em, including these pear chestnut crumb cakes. I made some modifications to the original recipe, with wonderful results. Preheat oven to 350F. Line the muffin tin with liners. 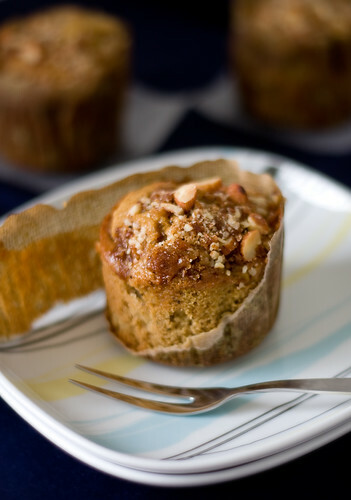 Mix almonds and jaggery for the crumb topping. Set aside. Mix flour, baking powder, baking soda, salt, cinnamon and allspice in a bowl. 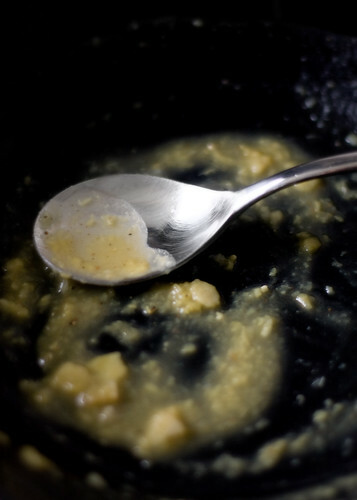 In a different bowl, cream butter, jaggery and applesauce together, until light and fluffy. Add eggs, one at a time, mixing well after each addition. Add vanilla extract. Mix in flour alternating with milk. Finally, fold in pears and chestnuts. Take care not to over mix the batter. Scoop the batter onto the cupcake liners, top with the crumb topping and bake for about 25 minutes for large muffins or 20 minutes for standard size muffins. 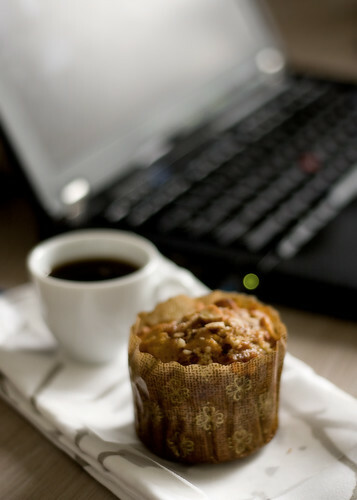 Test doneness by inserting a clean knife into the muffin. They should come clean. Take the muffins out, cool on a wire rack. Serve warm with coffee or ice cream. * To cook chestnuts, score an X on top of the shell. Fill a pot with water, drop chestnuts and boil for 20 minutes. Drain, cool and peel the skins. Or roast them as shown here. The cakes were very moist and mildly sweet, thanks to the pear and chestnuts. They also freeze well, making them a perfect snack, any time of the day. 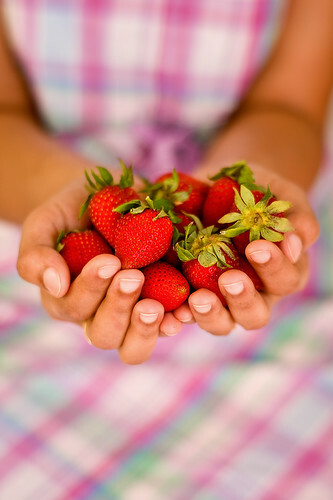 I am sending this to Eating with the Seasons: December by Maninas:Food Matters. Its my turn to invite you all to this edition of My Legume Love Affair, a monthly event at its infancy. Don’t let that fool you, cause this event has cherished such success month after month in this short span. The brains behind this event is a Well Seasoned Cook, Susan, the eloquent blogger and a splendid photographer. The nights are nippy and I have begun to crave hot and spicy dinners. I was brooding how spicy foods feel special on wintry nights. Like how the spicy bowl of Italian lentil soup, which I have made many-a-times during summer, felt cozier last week. With winter months ahead, I thought it would be nice and handy to have some spicy legume-based recipes up our sleeves. So, this would be the winter edition of MLLA, calling for hot and spicy legume-based recipes. While I was receiving entries for JFI – Whole Grains, I noticed some of us were confused with legumes and grains. So I want to make sure we are in the same page. We are talking about pulses like the ones listed here. Also, a prize, which will be announced later, is offered by Susan to one of the participants. Details to follow in a later post. 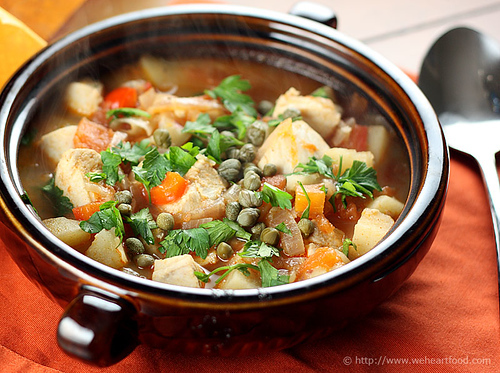 Prepare a hot and spicy vegetarian/vegan recipe with legumes as the star ingredient. The spicier, the better. Any cuisine, any course is acceptable as long as it features legumes. Eggs are allowed. You are welcome to submit multiple entries. Entries in English only please. Post about in your blog between now and 31st Dec ’08. Please provide a link to this announcement and to Susan’s event page. Send a mail with MLLA in the subject line to tastypalettes@gmail.com with the following details. So, come share your favourite hot and spicy legume creations with us. Here are the results for this edition of DMBLGiT. The 77 entries received were scored based on three categories - Edibility, Originality and Aesthetics. The three entries with highest total scores are overall winners. Excluding these entries, the ones with the highest category score are the winners in the respective categories. I want to extend my sincere thanks to the judges Susan, Graeme, Lauren and Meeta. I appreciate your time and effort, considering that last weekend was Thanksgiving in the US. 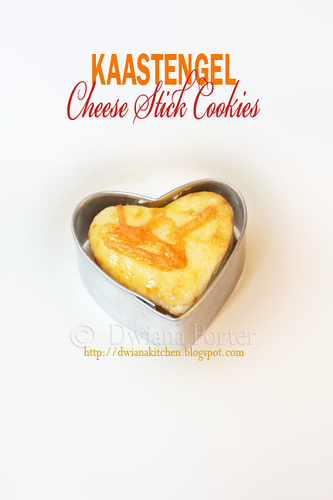 Dwiana of The Adventure of My Cooking Diary - Kaastengel "cheese stick cookies"
As the host of this edition, I would like to award Chris and Lisa of We [Heart] Food - Basque Fish and Potato Stew. I love the colors and textures in this photo. The steam is captured so well. I, along with other judges would like to congratulate the winners. Here are the badges. Pick a colour and go ahead, wear it in your blog. Few acknowledgments before I wrap up. Arfi, who is also this month’s winner is hosting the next edition. Don’t forget to send in your entries. ‘Kadambam’ in Tamil refers to an assortment of similar things. It more commonly refers to a flower string which is a mixture of flowers like malli, marikozhundu, sampangi, davanam, kanakaambaram. The garland is extremely fragrant and the varying colors are such a treat to the eye. I love wearing this flower garland in my hair, particularly after an oil bath. The damp hair absorbs the scents of the flowers, leaving it fragrant even after two days. Now-a-days, I don’t see women wearing this garland anymore. White jasmine strings are preferred to a more country-esque kadambam. Come to think of it, wearing flowers itself is going out of style. I am an ardent lover of wearing flower strings and I miss it dearly. Kadamba sambar, a speciality from my native, Thanjavur, is akin to its namesake garland. The vegetables are varied in terms of color, texture, taste and looks, yet aesthetically delightful. 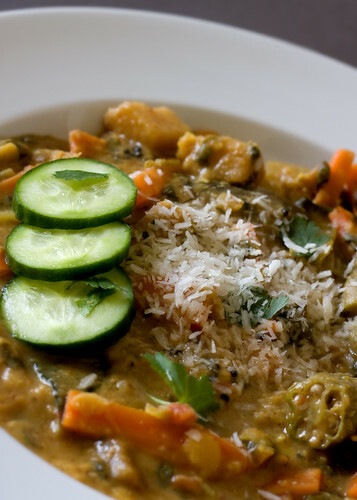 The recipe is very similar to arachu vitta sambar, but the vegetables make a difference. But this is ezhukari kuzhambu, one may say. Yes and no. Yes, because, they both are special kinds of sambar made with more than one vegetable. No, because, ezhukari kuzhambu is never meant to be eaten with rice. Its more of a side dish. 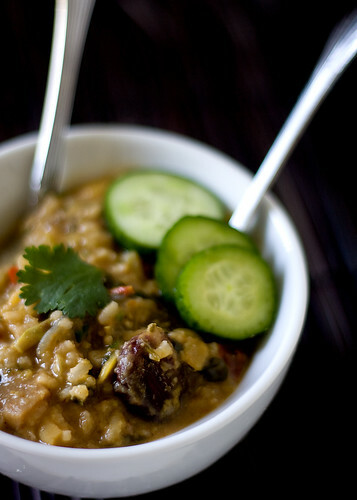 Secondly, ezhukari kuzhambu is always made during the winter months, predominantly with winter vegetables and squash. On the other hand, kadamba sambar is made all year around and is always mixed with rice. That’s not much of a difference, you say? Well, that’s up to you. Call it any name you want, its scrumptious. This sambar is usually made with ‘naatu karigai’, which is Tamil for country vegetables. So vegetables like cauliflower, green beans, beetroot are off limits. Also, I have used coconut milk which is not conventional. But I would recommend it highly. And, so the ghee. But if you want to make this vegan like I did, you can omit that too. I have also used a handful of dried jackfruit seeds that I collected during summer. They take a long time to cook, about 8-10 whistles in the pressure cooker. Roast chana dal through fenugreek seeds in oil. Cool and grind along with coconut to a smooth paste. Dissolve tamarind paste in 1 cup of water. In a deep vessel, boil tamarind water along with salt, turmeric powder, tomato and mixed vegetables for about 15 minutes. 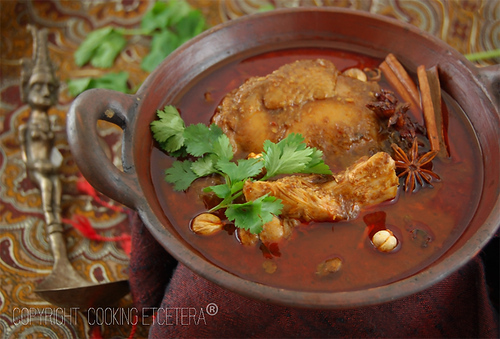 The vegetable should be fully cooked and the tamarind shouldn’t smell raw anymore. Add the cooked dal and spice paste and allow sambar to boil for 5 minutes. Stir occasionally. Finally add the coconut milk, if using and switch off the flame. Mix well and let the coconut milk to heat through. Stir in asafoetida and cilantro. In a small skillet, heat oil/ghee and splutter mustard seeds. Remove from flame and add curry leaves. Add this seasoning to the sambar. Serve this sambar with rice and additional ghee, if preferred. Mix generous ladles of sambar into rice (called saadam in Tamil), mix well and serve warm ‘Kadamba Saadam’ with crunchy cucumber slices, vegetable chips or appalam. The rice should not be dry, but porridge like consistency. If you want to include onions, slice ‘em thin and sauté with mustard seeds while seasoning and add to the sambar. Omit asafoetida though, as it doesn’t go well with onions or garlic. This is my entry to Rice Mela, hosted by uber-energetic Srivalli. This is also my fourth and last entry to Vegan Ventures, round 2, which runs till the end of this month. See you all next week. Have a great time with your family. A gentle reminder that Does My Blog Look Good in This – Nov ’08 closes tomorrow by midnight EST. If you haven’t sent your entry yet, please hurry. Vegan Ventures, round 2, the other event I am hosting this month, is open for another 10 days. I have received some fantastic entries so far. Keep ‘em coming. Checkout my latest post at The Daily Tiffin - Chocolate Spoons. Fajita is a flavorful way to enjoy tofu. Tofu responds extremely well to any kind of marinade, by absorbing the flavors like a sponge. I usually marinate them for more than 8 hours for a couple of reasons. One, the tofu gets more time to soak up the flavour. 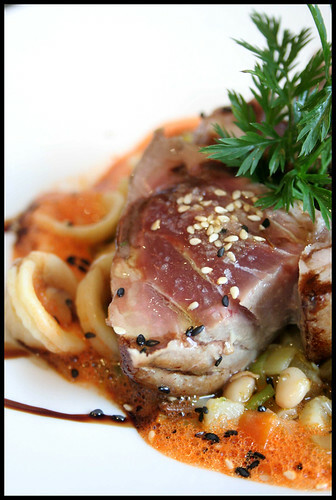 Two, the flavors of the marinade also dictate the direction in which the recipe is carried along. Once that is defined, cooking is a snap. Which means, I don’t have ponder over what to cook, with my head stuck inside the ice box. Take this marinade, for example. Once the tofu is doused with the Mexican flavours, I know I can make fajitas for a work week lunch or dinner. I have used chipotle (smoked jalapeno), that imparts a beautiful smokey flavour. They usually come in cans with a red sauce called adobo, and are available in most of the super markets. If you can’t find it, then use red chilli powder, a tbsp of ketchup and more cumin powder. Firmly press tofu between layers of paper towel to remove as much liquid as possible, then cut into two pieces, width wise. Mix all of the marinade ingredients together, and pour over tofu slices. Toss gently to coat all over, and refrigerate for at least 20 minutes to 48 hours. Heat about a tbsp of oil in a skillet over high heat. Sear the tofu slices until they are browned on both sides. Transfer to a plate, cool slightly and cut into thin strips. In the same skillet, heat another tsp of oil and add onion, green and red pepper, oregano, cilantro, salt and pepper, and stir fry over heat until browned and fragrant. 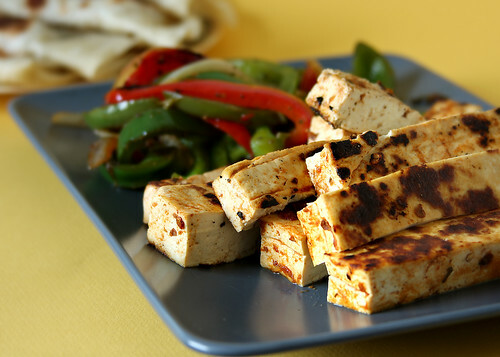 Serve tofu and pepper mixture with warm tortillas (or rotis). You can also serve along with brown rice, black beans, guacamole, and salsa for a complete Mexican platter. This is my third entry to Vegan Ventures, round 2. There are about 9 kinds of whole grains in my currently-understocked-pantry, as I am writing this post. I barely eat white rice anymore; just twice or thrice a month. No, this is not a fashion statement (unlike the “I don’t watch Indian movies, only ingleeesh” kind), but more of a health-conscious one. Like family heirlooms, both our family trees have generous genetic ailments waiting to be bestowed upon us. No thank you (not so for the diamonds. Am I clear?). 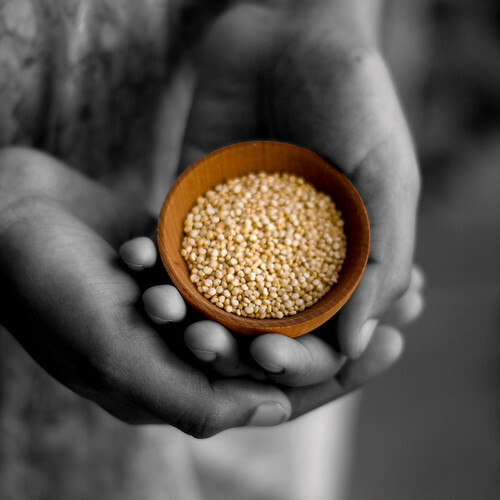 Discovering the world of whole grains and their various cooking methods is such a delight. But once in a while, we do long for our childhood favourites. There are some dishes that we grew up with and the sight, smell and taste bring back a gush of memories from our early days. Now I am learning to incorporate the whole grains in Indian recipes. It doesn’t turn out well all the time. There are some bad days (as with any cooking experiments) and then there are days with outstanding results. Quinoa paratha is one such dish. This recipe is an extrapolation of this upma. I kept the seasoning to a minimum just like the upma. Tastewise, these parathas weren’t any different than the usual wheat ones, but the addition of quinoa did make them soft and supple. I am sure there will be more 'whole-grain-flatbreads' from my kitchen. 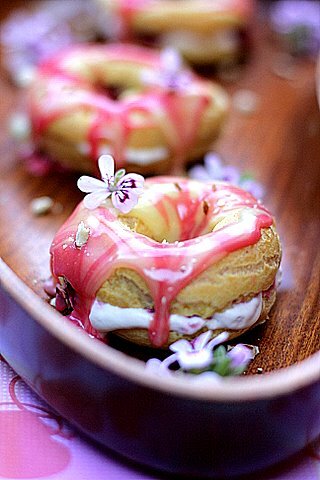 Before going to the recipe, I am thrilled to announce that Margot at Coffee and Vanilla has nominated me for this month’s Inspiring Food Photography. I have some tough competition with fellow nominees, Michelle of Green Gourmet and Leemei of My Cooking Hut. If you have enjoyed your visits here, please hop over there and vote for me (yeah, shameless self promotion. I know!). Cook quinoa with 1 cup of water. You can either do this using a pressure cooker for 2 whistles, or on stovetop. Fluff, and let cool, but not completely. I made the dough using food processor. Using the shredder attachment, shred carrots, onion and green chillies. Remove the attachment, fit the blade, add warm quinoa and salt, and pulse everything together, until it forms a solid mass. Add 2 cups of flour and pulse until the dough forms into a ball. 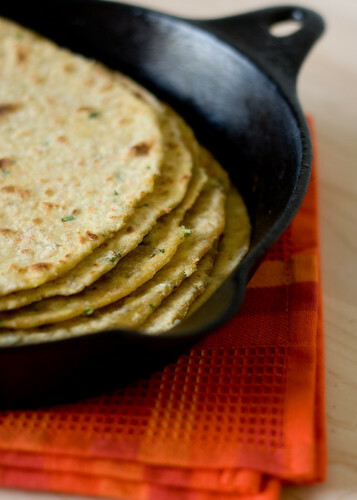 Turn the dough onto a big bowl or working area, sprinkle cilantro and carom seeds on top of it. Add flour ¼ cup at a time until the dough isn’t sticky anymore. Knead for 5 more minutes until it is soft and elastic. If you don’t have a food processor, prepare vegetables separately, grind the cooked quinoa coarsely and proceed as mentioned above, until you are left with a soft and elastic dough. Cover with a moist towel and let the dough rest for 20 to 30 minutes. 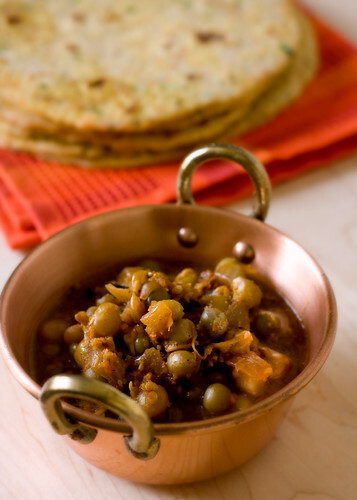 Prepare vegetables or gravy to go along with the paratha. I served mine with Ashwini's Green Peas Curry. I have made this curry with different legumes. It tastes absolutely fantastic every single time. When ready, pinch a lemon sized ball of dough, (about 2 inch), dust and roll on a well floured surface, as thin as you can. Cook on preheated flat skillet, with a light drizzle of oil on one side. 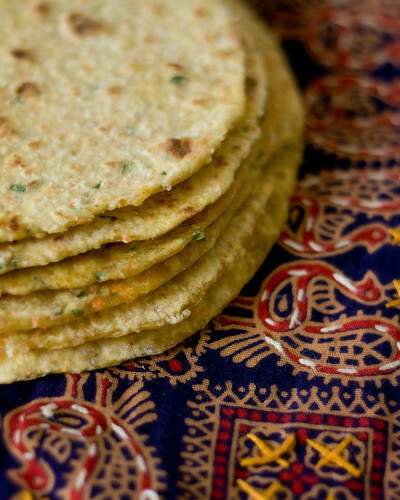 The parathas are done when they develop light brown spots on both sides. These flatbreads were naturally soft. But I find cooking any kind of roti/paratha (the non-stuffed kind) over medium-high heat ensures the soft texture. You have to be careful not to burn the roti, by flipping every 30 seconds. These parathas were done just after 2 flips. This is my second entry for Vegan Ventures, round 2. 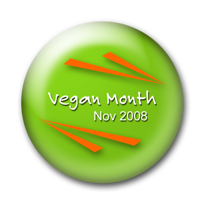 This event celebrates the National Vegan month, November. 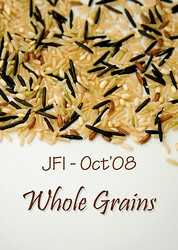 More whole grain recipes can be found at JFI - Whole Grains roundup. I realized that its been long since I posted a recipe. Not that I ain’t cooking. In fact, I did try a lot of new recipes from my bookmarked folder in this past month. But to plate and photograph our meals feels like too much work. Pure indolence, I should say. Adding to that, the emails that are waiting to be answered, the reader bursting with unread posts, the deadlines - not at all encouraging. But today, I got over my lethargy, and clicked a few shots. Nothing fancy, a clove of garlic, a sprig rosemary, and yeah, these stuffed tomatoes. It was comforting, and made me feel ‘in the zone’. Oh yeah, I can get back to blogging. Slice the tops off the tomatoes and set aside. Scoop out the flesh from the tomatoes to allow room for the stuffing. Take care not to break the skin. Strain this pulp and add to the filling. Make the stuffing by soaking the bulgur wheat in warm water for 30 minutes. Drain and squeeze excess water, if any. Mix with all the other ingredients mentioned above, except dried oregano. Also, reserve 1 tbsp of pumpkin seeds for garnish. Preheat oven to 350F. Season the inside of the tomatoes with pepper (too much salt can make the tomatoes soggy). 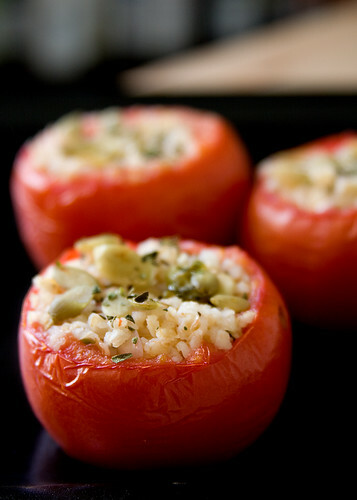 Fill with the bulgur stuffing and replace the reserved tomato tops. Place them on a lightly oiled baking dish, pour a little water around them and bake for 40 minutes. 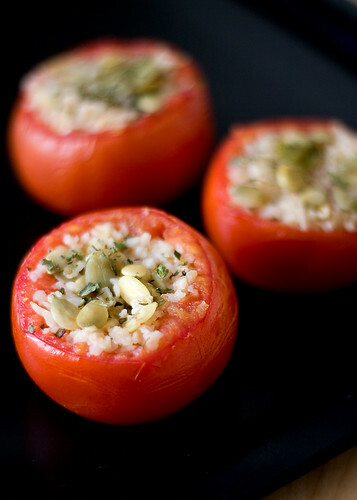 Remove the tomato tops, sprinkle with the reserved pumpkin seeds and dried oregano, and serve hot or at room temperature. I served them with a side salad for a light lunch. You can also serve ‘em with garlic bread and soup for a hearty dinner. This is my first entry to Vegan Ventures, round 2, an event in observed during November, the National Vegan Month. I am far behind in keeping up with the other blogs and the various events. I promise to be back in the scene as soon as I settle a few things in the background. I am honored to host this edition of ‘Does My Blog Look Good in This’ (DMBLGiT), a monthly food-photography challenge that showcases some of the best photographs that have appeared on food blogs. Many thanks to Andrew of Spittoon Extra for this opportunity. Overall Winner: top overall scores in all three categories combined. For complete set of instructions on participation, visit Spittoon Extra. The judges panel for this month consists of these gifted and talented food bloggers/photographers. Graeme of Blood Sugar, a student of photography from Lincoln. Photography is a continuous process of experimenting and learning. His blog showcases exactly that. He is currently working on an interesting project called ‘Culture Stills’. Susan of The Well Seasoned Cook, the creator of the esteemed and popular event My Legume Love Affair. A multi-faceted, eloquent writer, she makes food blogging all the more interesting. Lauren of Vegan Yum Yum, who has won the VegNews Veggie Award for best blog of 2008. Congrats Lauren! 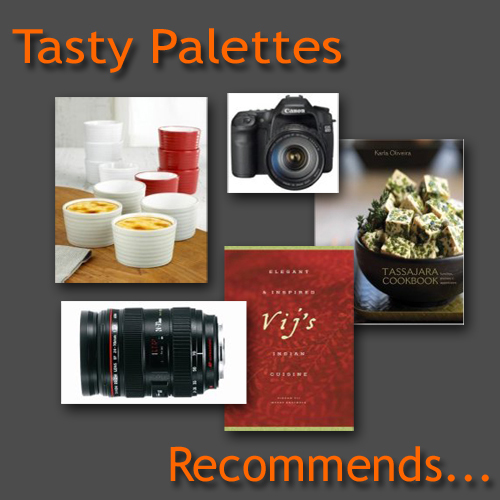 Her post on food photography is a must read for aspiring food photographers. Meeta of What's For Lunch Honey?, a master photographer, a conscious cook and an accomplished food blogger. She is also the owner of The Daily Tiffin. Run by a talented bunch of bloggers, the blog focuses on family, children, health and many more. And, of course, myself (nothing much to say). Send a photo that has appeared on your blog during October 2008. The photo should be food and/or drink related. No diptychs allowed. You can find this month’s entries in this gallery. I will upload your submissions as and when I receive ‘em. You can access the gallery anytime by clicking the icon in the left pane, under 'Events'. 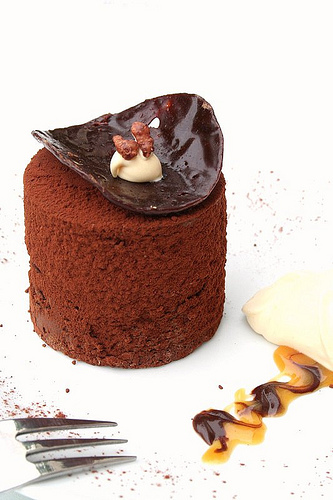 For last month's winners, visit Cafe Fernando. Here it is, the long awaited roundup of Jihva For Ingredients – Whole Grains. Before I proceed with the roundup, I wish all the readers A Very Happy Diwali. Most of you know that I was away while hosting this event. Indira of Mahanandi, the creator of JFI, graciously allowed me to be flexible with the hosting. Thank you, Indira. A big thank you for all the participants for your gorgeous, wholesome submissions, even though I took my own sweet time to respond to your emails :). The entries are listed below for easy reference. Click this link or the logo below to visit the gallery for a more detailed look. One bite at a time - Wholewheat bread with bran and sesame seeds! The next edition of JFI - Festival Treats, is hosted by Srivalli at Cooking 4 All Seasons. I am back from my long vacation. Though its good to be back, I am thoroughly exhausted from my trip. Jet lag, exhaustion and not to mention, the mounds of laundry waiting to be done, has taken off even the littlest energy left in me. Nothing fancy is dished out from my kitchen these days too. Simple, comfort food is all I crave for now. Many thanks to all whom participated in JFI – Whole Grains. I have received all your entries and will be back with the roundup shortly; after I am done with the laundry and unpacking of suitcases, that is. 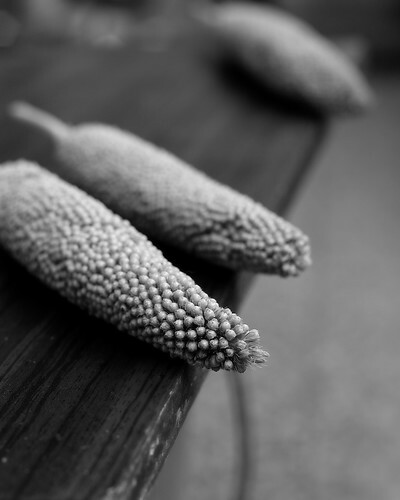 Pearl Millet, called Cumbu in Tamil. I was lucky to find one this time in India. Burgers are one of the tastiest ways to incorporate whole grains in our diet. In addition to tasting far better than the rubbery soy patties served at the burger joints, they are nutritionally rich too. Adding a handful of legumes or lentils ensures that the patties hold their shape well. With few shreds of vegetables and a sprinkle of fresh herbs, you have one winning formula for a delicious vegetarian/vegan burger. I have been wanting to make burgers using millet for a long time now. I have successfully used chickpeas many times in burgers before. This time I sprouted ‘em before pairing with millet. With a little bit of onion, carrot and cilantro for color, and sunflower seeds for crunch, this is one of the best burgers I have had. 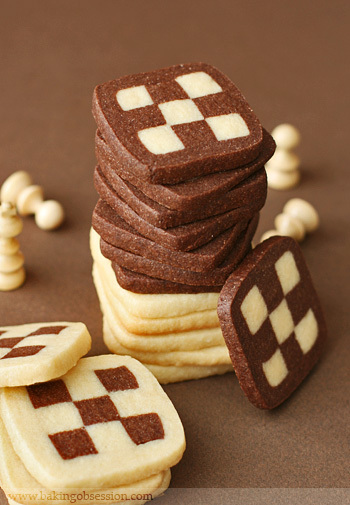 To my surprise, they held their shape extremely well, froze beautifully and most of all, tasted delicious. I have already made these burgers twice and there are many more to come. 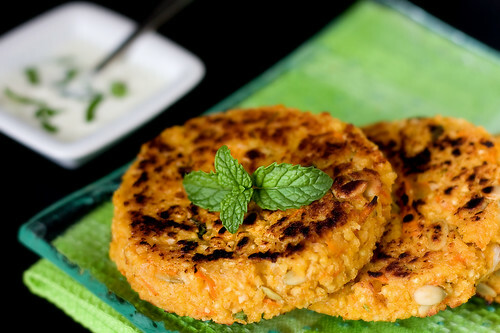 Millet burgers specked with sunflower seeds, served with mint-yogurt. Pressure cook millet with 1½ cups of water for 2 whistles. Or cook the grains over stovetop till soft. Cool, fluff and transfer into a big bowl. In a food processor, grind the cooked chickpeas along with garlic, cilantro and red chilli powder. Add this to the millet bowl. In the same food processor, shred carrot and onion. Add the vegetables along with sunflower seeds into the bowl. Season with salt, pepper and mix everything together. Add corn flour+water mixture to the patty ingredients, one tbsp at a time. Mix thoroughly and try forming a ball. If it holds its shape, proceed to forming patties, else add more of the corn flour mixture. Take about 1/4 cup of the mixture, form into a patty and cook on a flat pan/griddle sprayed with olive oil. When the patty develop charred spots on both sides, remove and serve with burger buns and condiments. 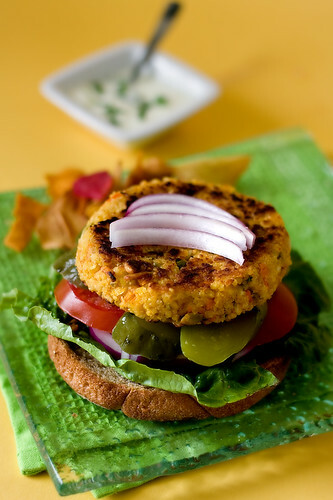 Millet-Chickpeas burger served with onion, tomato, lettuce and pickles. 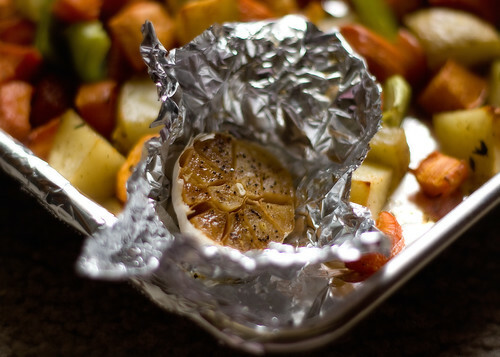 Wrap the leftover patties in double foil, put them in a zip top bag and freeze for up to 3 months. This is my third and final entry to JFI – Whole Grains, which is closing today. As announced earlier, I am on vacation and will post the roundup only during mid-October. Meanwhile you are welcome to send your entries till first week of October, in case you have missed sending 'em by now. Srivalli at Cooking 4 All Seasons is hosting the next edition of JFI, inviting Festival Treats.